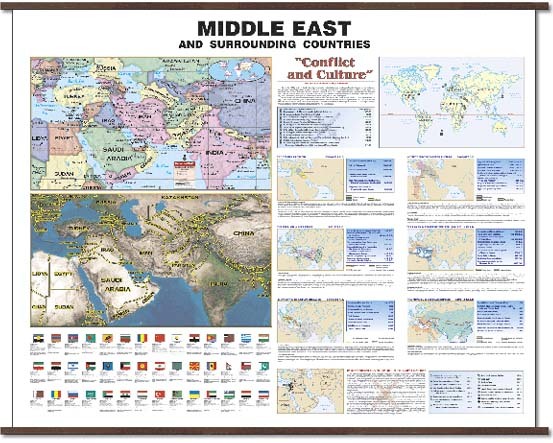 The special features found on the new Middle East regional wall map are as follows: Political map of the Middle East region and surrounding countries, with color coded countries, captions of major cities and capitals, from Greece and Libya in the East to Bangladesh and China to the east; from Bulgaria and Uzbekistan in the North to Somalia and India to the South. Centered on Iran and Iraq, it includes Turkey, Egypt, Sudan, Syria, Israel (and occupied territories), Jordan, Saudi Arabia, Yemen, Oman, United Arab Emirates, Qatar, Bahrain, Kuwait, Armenia, Azerbaijan, Pakistan, Afghanistan, Nepal, Buthan, Kyrgystan, Tajikistan, Turkmenistan, most of India and Southern Kazakhstan. Captioned images of the flags of the countries depicted. Inset map of the world with captions of the continents, the oceans and the Equator. "Conflict and Culture" feature includes seven historical maps which depict the various empires of the area over the centuries.